One of the joys of my post is that I get to hear the stories of UN Volunteers on the ground. 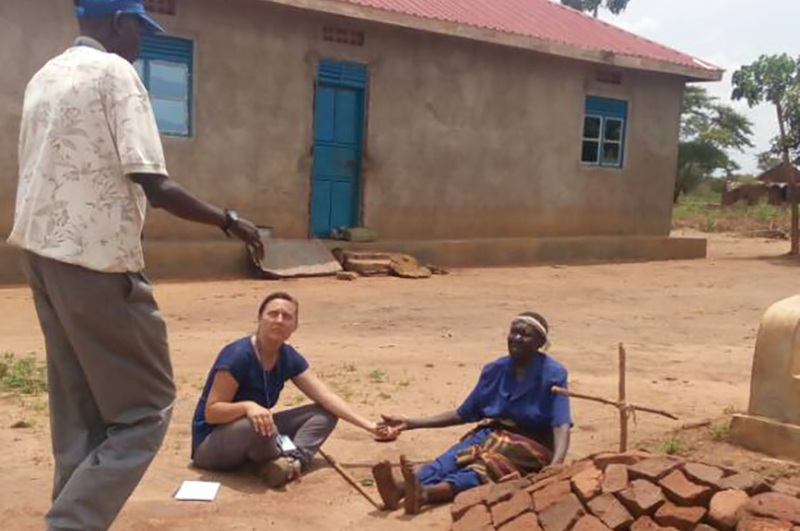 A particularly moving story I came across recently was shared by Leni Kinzli (United States), Public Information Officer with UNMISS in Torit. Through her UN Volunteer assignment, Leni contributes to the outreach and communications efforts of the UN Mission. Over the last year, the Field Office in Torit held dozens of presentations with local communities to inform them about the UN’s mandate in South Sudan. These meetings allow communities to gain a better understanding of how the Mission can help them contribute to the peace process, and how they can get involved. Earlier this year, Leni participated in an integrated mission patrol to Pajok in Eastern Equatoria State to assess the humanitarian and security situation following a clash between government and opposition forces. Thousands of civilians fled to Uganda following the incident. Few people remained in the town and the UN went house to house to find locals who would tell their stories. Leni encountered an elderly woman cowering on the steps of her ransacked house, clearly traumatized by what she had witnessed several weeks back. "The elderly woman had lost everything in the attack and was trying to explain how her grandson's life had been taken. She was speaking in Acholi, a local language I could not speak or understand. She took my hand and led me to the grave she had built for him in her backyard, then started to chant and wail to release her trauma. I sat with her for what seemed like hours as she kept telling her story, intermittently bursting into chant while I was trying to understand her words. By sitting with her and showing her compassion, she was able to open up about her experience—her very personal suffering. I held her hand so she wouldn’t feel alone." I think this is what volunteerism is about. Connecting with people and helping them, however difficult or challenging it may be. I will carry these experiences with me throughout my life in the hopes of learning and growing to make a greater contribution to the spirit of humanitarianism and peace. By reporting such stories on Radio Miraya, the UN-run radio station in South Sudan, Leni and her team share with millions of listeners throughout the country the latest news coming from Eastern Equatoria. The Public Information Office also plays an integral role in sharing information with the outside world. Whether through capturing photographs, writing stories or producing videos, the department disseminates information on South Sudan to evoke empathy and compassion for the suffering of the country’s people and galvanize international leaders towards action. This is just one example of one volunteer in one country where the UNV programme operates. There are many more moving stories such as this one that touch the hearts and minds of people, not only in South Sudan but all over the world. Their service should be honoured and revered for their dedication and clear contributions towards a more peaceful and just future. This is what drives me in my daily work—knowing that I work alongside true heroes who are serving for the greater good of humanity and peace.